If you have ever played any polished game where there is specular reflections of the game world, it was probably implemented with environment maps. An environment map can be implemented as a 6 textures mapped to the inner surface of a cube at infinity distance centered on the object being rendered. Cube maps are handy for creating things like image based lighting and reflection. Each face of the cube map covers a 90 degree field of view both vertically and horizontally. Loading in the cub map faces. You can simply increment it by the iterator counter which will get the next cube map face. Shaders for the sky box. To read the environment map texel that will correspond to the point on the surface of the object we take the incident vector from the camera to the point on the surface of the object and it reflect it around the normal of that point. 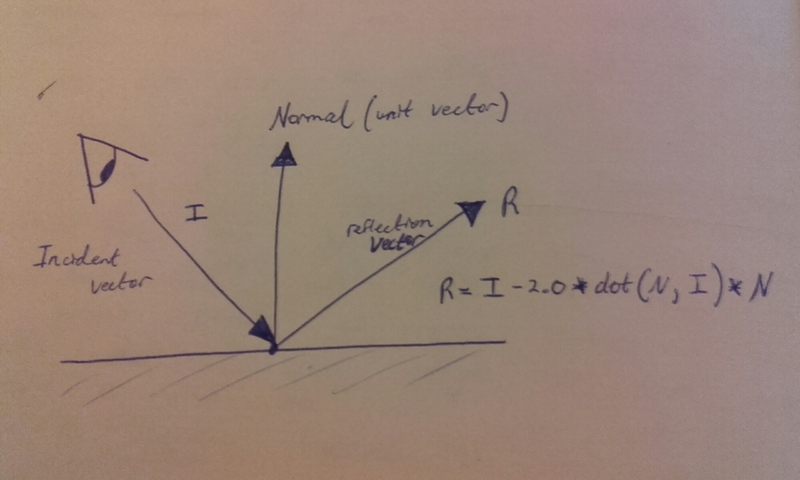 The value of the texture coordinate is found when the reflection vector intersect the cube map. This texture coordinate can be used to access the individall face texture of the cubemap. I have been working on learning a lot about OpenGL lately and this is one thing i have learned so far. I plan of making a tech demo like i did for my physics engine. With lighting, shadows, model loading and other goodies. I haven’t done Dynamic environment cube maps yet but i have mess around with frame buffers enough that when you could render the scene 6 times from the perspective of the Utah tea pot, in this case, and make sure the filed of view is 90 degrees to create a cube map.